This post is in response to a comment I received in one of my recent posts. 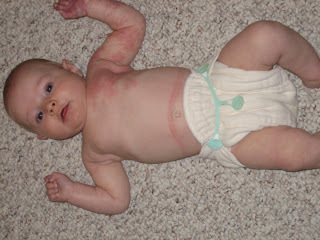 Do you remember how I was using cloth diapers on my baby? I started this craziness when Holly was about 2 months old; I was excited about it and convinced I needed to become a "granola mom" for my baby's health and safety. Well, I wanted to like cloth diapers. I wanted to LOVE them. So, so badly. I talked about it. I blogged about it. I read articles and went to websites. But a little part of me died inside whenever my dear child had a poopy cloth diaper. I would dread changing the thing, not to mention swishing it in the toilet and then washing it. Sound gross? It was. Ugh. Finally, I couldn't take it any longer. A few months ago (Holly was maybe about five months old), I had to throw in the towel. Andrew was confused. But I thought you liked cloth diapers, he said. Well, I was pretending to like them so maybe I really would like them. How dumb does that sound? All the time I spent and ahem, money I spent now sits on the lowest shelf of the changing table, useless to me. Member's Mark diapers, here I come! On the bright side, isn't my baby precious in this picture? She was only four months old. It melts my heart. By the way, cloth diapers are SO much cuter than disposables. There is no comparison. But I still couldn't continue with them. It was too much for my well-being. *By the way, Holly is actually 3 months old in this picture. It was taken in September, and she was born in June. He-llo! Oh Katie I am so glad to hear you gave up, not I don't feel so bad :) She is just the cutest thing ever. I wish they did not grow up so fast. I already feel like my little one is growing like a weed! We sure miss you guys!